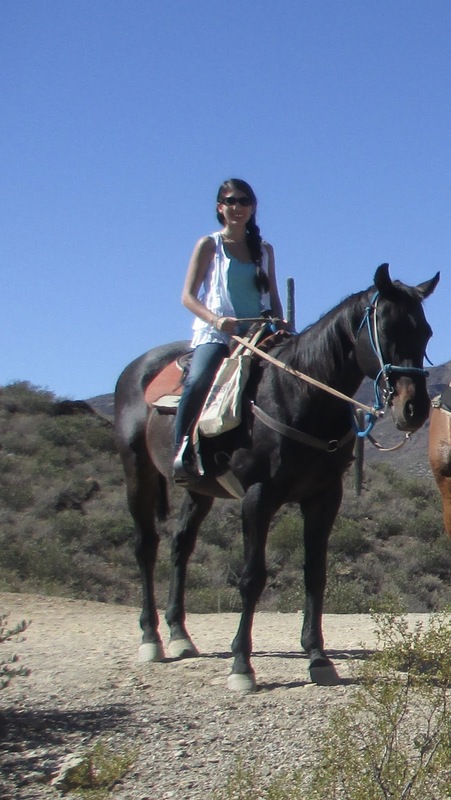 Located at the back of Cave Creek, Spur Cross Stables is just a couple of buildings, from which you can start a horse ride across the desert. An hour? Two? Three? Seven? It's all up to you. It was so bright out that I couldn't really see the camera screen, so I just snapped pictures hoping that a few would turn out. Given that none of us had really been on a horse before (at least, not in any way that really counts), we went for the short hour long ride. This turned out to be just the right amount of time. The staff there are helpful in matching you up to the right horse (they're all such good horses) and helping you on/off your horse. They show you how to use the reigns but for the hour long ride, you don't really end up needing to use them: the horses know the drill. Now, what makes this such a great place to go, even for a beginner, is the location. Cave Creek is one of those "big, rural" towns to begin with, and as I mentioned, Spur Cross is right on the edge. Their longer rides go into the Tonto National Forest Area, but basically the land in this region is classic desert: saguaros, prickly pear, and cholla. The teddy bear cholla are in fact one of my favorite cactus varieties; I always like to watch them when driving through the Anthem area. Given that the horses stay at a slow walk during this ride, you really have a chance to look around and enjoy each bit of scenery that you pass through. Unlike some of the other short horse rides that you might come across, this one goes right into wilderness land. Other than one house up on a hill (it was built before the the land became national forest) and one view toward the distant city, you won't see a single building during your ride. You actually, therefore, have the chance to imagine yourself back in time. To picture the army wives traveling with their husbands between posts or the cowboys moving from one job to another. A close-up from our group picture. Along the way, our guide told us a little about the plants and their uses. She also told some of the local history, about gold mining and the first dude ranch. All very informative and welcome info, especially since it made me realize that I didn't know much (if anything) about Cave Creek's history. Now let me get back to the horses. My horse was Joker, a retired race horse. We were in the back, and he did love to stop frequently, so I had to keep urging him forward. That did rather add to the experience. I felt grateful that he was crossing all of this terrain for me, and it was amazing to see how much ground we covered even going at a slow pace. No wonder having a horse made such a difference a hundred and some years ago. After the ride is the time to take two carrots out of the saddlebag to give to your horse as a thank you. We all walked away talking about how wonderful our horses were: "Joker did this" and "Johnson was so nice" and so on. I'm used to seeing horses, up close or from a distance, from the highway or around the neighborhood. But I wasn't used to spending such quality time with one horse. So this was a really great introduction to horses on a more personal level. Joker, you're the best.